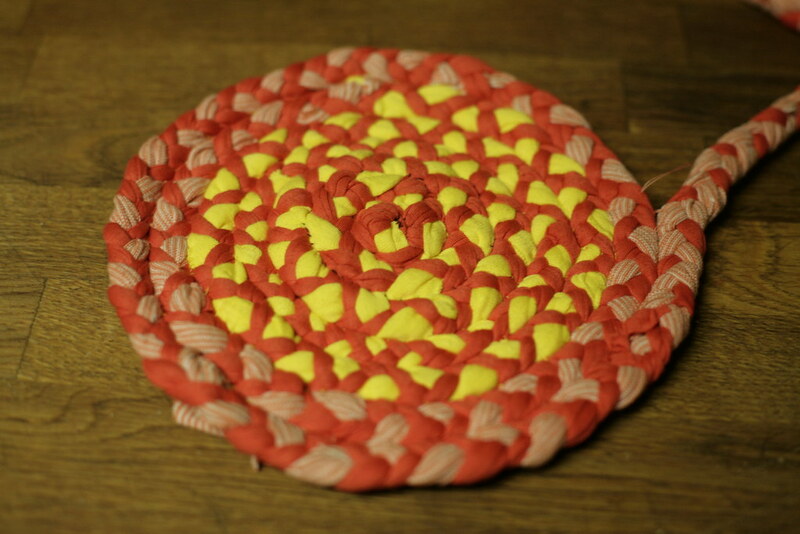 ... and make a braided rag rug using knit scraps and old t-shirts. Once again, middle of the night Pinterest inspiration struck, and I knew I just had to make a braided rag rug for my funky kitchen. In a warm sunburst of yellows, oranges, reds, and pinks (and maybe more - we'll see!). So I proceeded to read every online tutorial I could find on the topic (if you're interested, I pinned most of the links here), and I cut up some old t-shirts and scraps of knit from sewing and got to work. Rag rugs can be made from almost any fabric - cotton and wool are traditional - but I figured knits would be an easy place to start and would make a very washable rug. Plus, my pile of colorful scraps and thrifted t-shirts is currently threatening to take over my sewing space. What I've learned so far: The trick is in getting the coil to lay flat. Any change in tension and it wants to go concave or convex. The rug wants to a be a bowl. Or a big lumpy mess. Making a rug requires fighting against this natural inclination. It is extremely important, therefore, to work on a flat surface - this is not a lap project, but you can sit at the coffee table while you watch television. 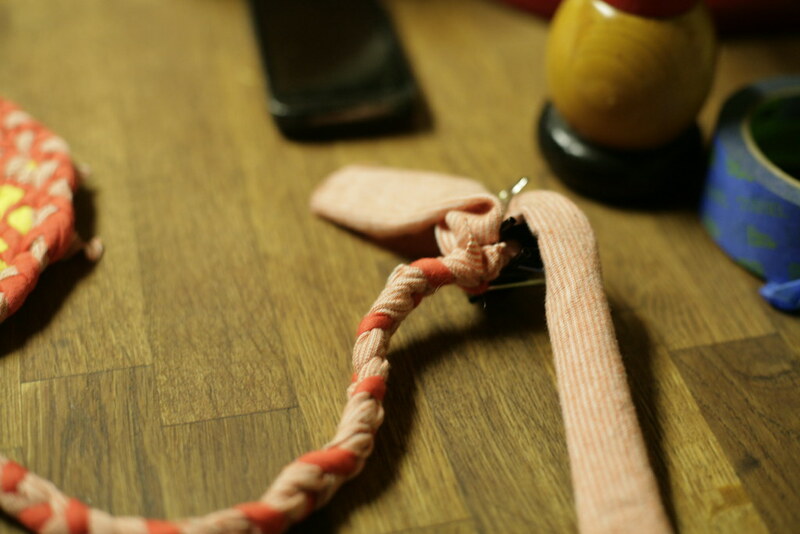 It is a little tough on the wrists because the braid has to be turned and secured just so as you sew it. There is a "feel" to it that I am still developing. Other than that, it's really easy. And it's growing fast. 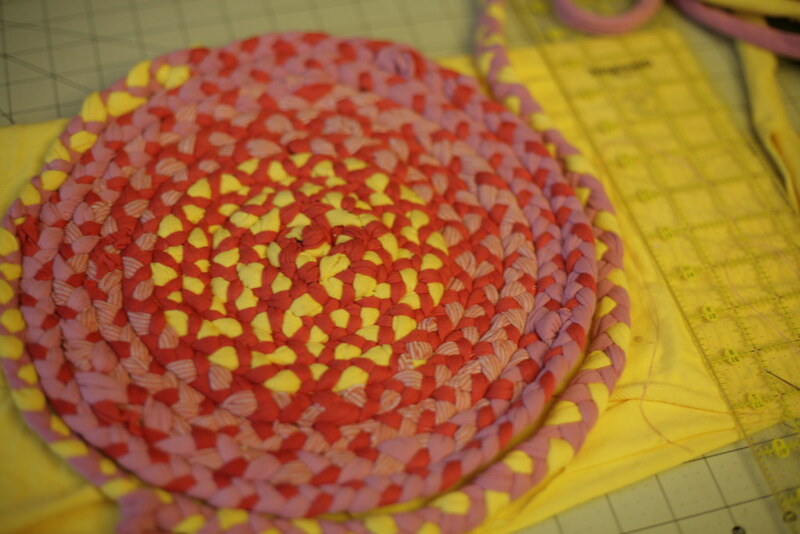 Most of the online tutorials mention that this is an extremely time-consuming and labor-intensive project. But for someone who has hand-quilted a couple of quilts, it doesn't feel slow at all. 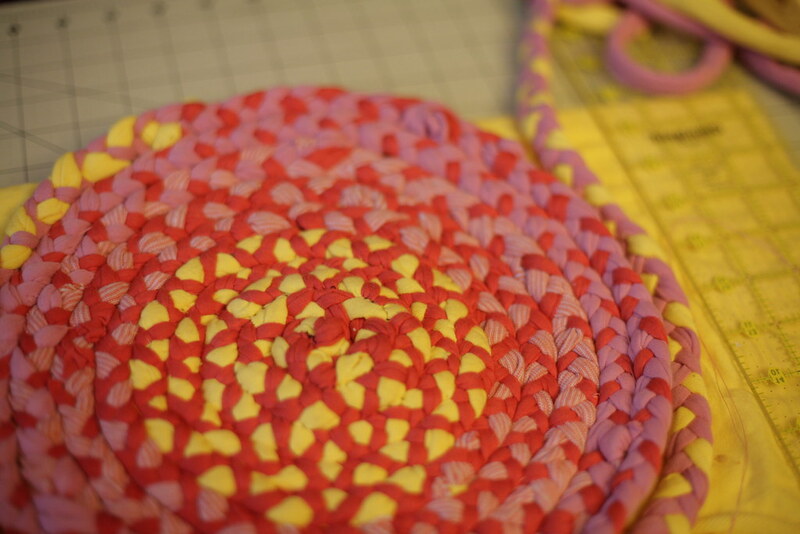 It is so fun watching the colors develop as you coil the braid around. It's strangely addicting! Making a rag rug will set a person musing about a time when very little went to waste, and old clothes or worn sheets were torn into strips and made into rugs, which lasted for years. And all of the little ways that my foremothers worked to bring a little cheer and beauty into their homes and lives even during the hardest of times - the triumph of human creativity and imagination over mere subsistence. Once you start a rag rug, you may decide that allowing the children to fingerpaint the walls while you work represents an acceptable compromise. Fingerpainting the walls is an activity that keeps children happy for a nice long chunk of time, allowing you to spend a lot of time cutting strips, braiding, and coiling. And pondering your next color change. Fingerpaint washes off the walls pretty easily, fyi. Joe says: "You should make it huge! Like this!" Holding his arms out wide. We had these in our old Mallee holiday house in the bush! So comfortable under foot compared to the freezing concrete. I love it! I can imagine!! It is wonderful to think of women trying to scratch a living out of the toughest places, spending their evenings making nice rugs for the house. I think about those Little House on the Prairie days a lot too, and then I feel suffocated by all my stuff. Your rug is a great way to get rid of some of those scraps. Haha! Sometimes I feel a bit suffocated too, but I am really really glad to have (a) a washing machine and (b) a dishwasher! Those are two things that I would NOT want to give up to go "off the grid"! I am so not surprised after seeing all those pics you pinned :) I have sometimes thought of making one of these and will eagerly eat up all the tips you can share. I love that waste-not-want-not kind of crafting. Although I probably draw the line at knitting with cut up plastic bread bags. Loving the happy colours you are putting in there. Haha! Yes, you can definitely predict/see my obsessions with Pinterest! Joe says I should put green and blue and purple in it, like a rainbow, so I might just have to! Inder this is so awesome, cheerful, and super inspiring! Thanks! It's really fun! I'm getting such a kick out of it, honestly. 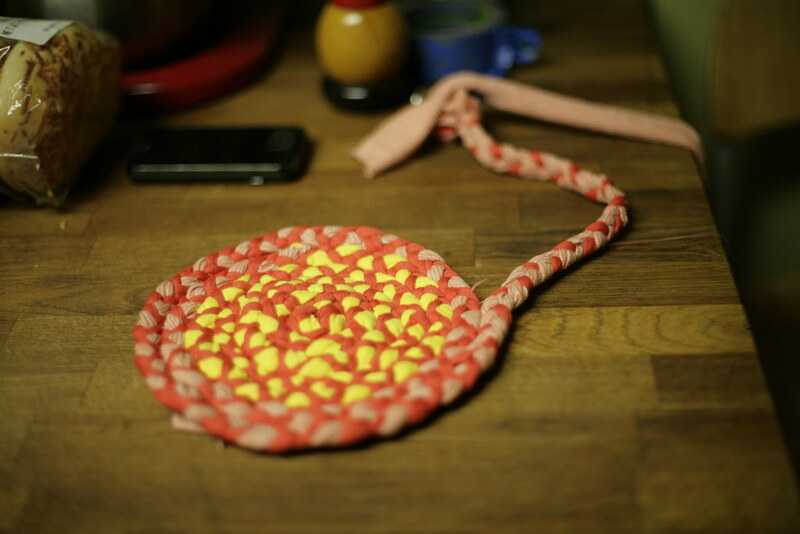 I made a rag rig back when I was eight months pregnant with O and I have nothing but the fondest memories of sitting at the kitchen table and braiding away. Unfortunately my rug won the battle and is a bit wonky in the middle (convex? Concave? I can never remember bwhich one). One day I'll bget around to ripping it out and sewing it together properly. 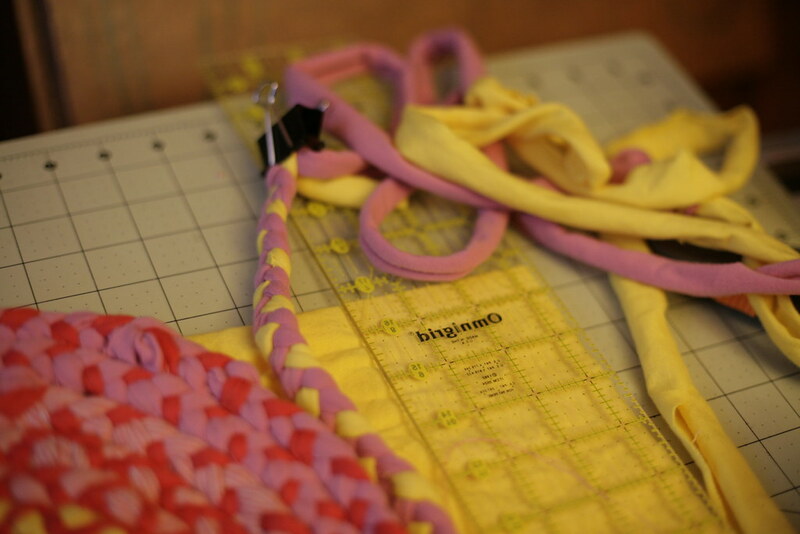 What a neat way to use up left over fabric and repurpose old clothes! We have a couple of small wool rag rugs that my MIL made. They are super durable and have withstood 17 years of dirty shoes being wiped on them. ;) I'll have to check out your links. Can't wait to see what your final rug looks like!